Many backyard flocks these days are carrying Mycoplasma. There are many different kinds of Mycoplasma but Mycoplasma Gallisepticum (M.G) is the most common. Mycoplasma Gallisepticum causes respiratory disease and can weaken the birds immune system sufficiently for them to pick up any disease that they come into contact with. Small bubbles in the corners of eyes and swollen sinuses are usually the first sign of Mycoplasma. Once birds have been infected, they become carriers and remain infectious for life. Some birds seem to have a good resistance to M.G. and out of an infected flock, a few may die, others may become ill and recover and some may not show any symptoms at all. The first time they are ill seems to be the worst and subsequent outbreaks seem to be milder. Bringing new, perfectly healthy younger birds into an established flock of carriers is typically a problem. New birds can be Myco free but with the stress of being moved and not having much resistance to M.G. will become sick after a week or two of arriving and the established flock appears to be healthy. The stress trigger can be small such as moving birds to different housing, adding new birds, a change in diet, parasite infection or even a sudden change in the weather (snow for example). Some birds die, some birds are only carriers and some birds are sick and recover but repeatedly have bouts of illness (not normally as bad as the first time though). As it can be carried by wild birds, it is a problem with birds that are allowed to free range as they can come into contact with it easily. The infectious agent survives for only a matter of days outside of the birds. Commercial operations operate an ‘all in, all out’ system to ensure they do not have problems. A blood test can be done at your vets. The blood samples are usually sent to a specialist poultry laboratory for analysis. In Ireland, it is advisable to test all new stock that you buy since it is a notifiable class A disease and the Department of Agriculture in Ireland recommend culling all birds that test positive. Symptoms: In growers: Loss of appetite, slow growth, In Chickens & Turkeys: Ruffled feathers, fluid in eyes (small bubbles in the corners of eyes), coughing, sneezing, ‘darth vader’ breathing, gurgling / rattling, swollen face, strained crow in cockerels, drop in laying in hens, sometimes loss of appetite, sweet smelling breath. Chicken with Mycoplasma Gallisepticum showing difficulty breathing and small bubbles in the corner of the eye. Photo courtesy Grant Brereton. Area affected: Respiratory system (mainly) but can effect the Kidneys. Transmission: Infection from other carrier birds (from their respiratory dischages), including wild birds. Through hatching eggs. From infected dust / bedding material. Chickens and Turkeys can cross infect one another, other species have their own type of Mycoplasma that cannot cross infect. Mycoplasma is highly contagious and can be carried in on shoes, clothing and feeders / drinkers etc. Mycoplasma can survive for several hours on these things. Diagnosis: Contact with wild birds or other carriers (poultry shows), bringing new birds in that are carriers, stress factors (change of food, house, worming, over crowding, new birds in the flock, cold weather – snow covering the ground for example, shortage of food or water, ammonia from soiled bedding). Breathing difficulty, laboratory identification of bacteria in post mortem, identification by blood test. Prevention: Good biosecurity, minimise stress, vaccination is possible but is done via an inhaled mist and equipment to administer is expensive, keep birds immune systems strong with the right diet. Fresh crushed garlic in food or water is great for the immune system and Apple Cider Vinegar. After an infection, disinfect housing and leave for 2 weeks. Mycoplasmas cannot survive for long in the environment. Treatment: Antibiotics from your vet: Tylan, Baytril, or Gallimycin are often prescribed. Treatment needs to be early on for a greater chance of recovery. Many respiratory problems are labelled as “Mycoplasma” by backyard chicken keepers but there are other respiratory diseases. 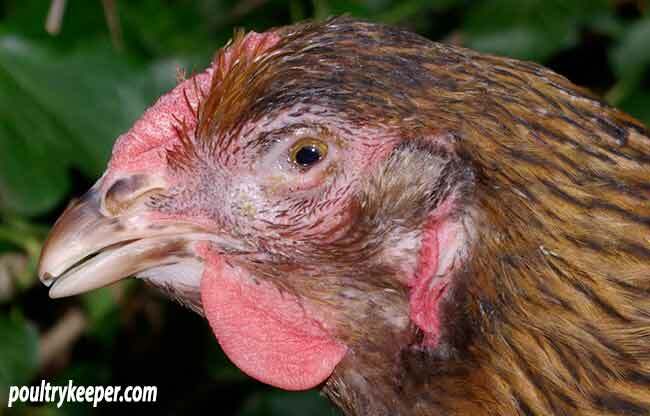 You can read more about respiratory problems in chickens here.